We are reckoned as one of the known organization in the market, highly indulged in offering Chain Link Fencing. These offered products are developed and manufactured using finest grade factory inputs and progressive tools. More to this, provided products are obtainable in varied sizes and specifications. Chain Link Fencing manufactured from interlocking Galvanised Wire. The opening starts from 12mm & wire diameter from 1.6mm. 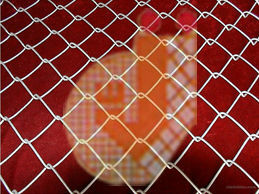 We are leading manufacturer and supplier for Chain Link Fencing. Our range of Chain link Fencing is widely appreciated by our clients which are situated all round the nation. We offer the range of Chain link Fencing at most affordable rates. Chain Link Fencing is available in different type of size and color, it can be customized as per requirement of customer. The fencing provides additional defense against corrosion. It gives an aesthetic look. It can sustain in extreme hot weather and is Ultraviolet resistant.